- Measures: Width: 313x105 cm Depth: 60 cm Height: 262 cm Weight: 2480 kg - 2 year Guarantee! - Free Shipping! 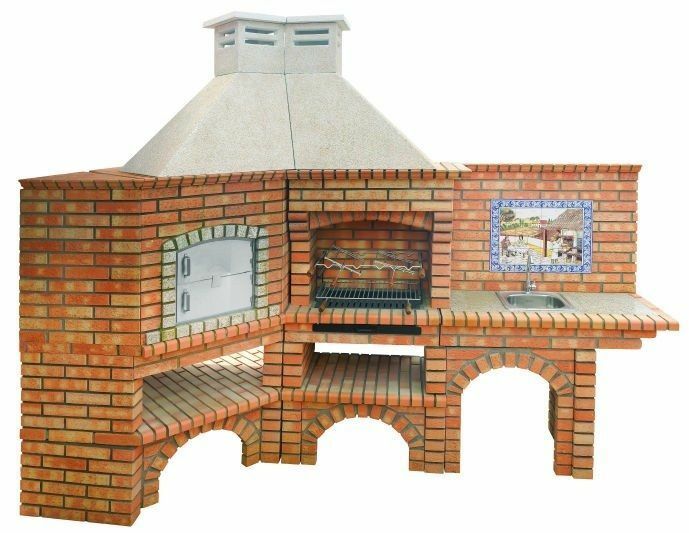 Corner Barbecue and Wood Fired Oven with Sink CE1001B Free shipping to England, metropolitan France*, Monaco, Belgium, Luxembourg, Italy and Spain. For other destinations please contact us. Make Thai-style marinade: Combine kecap manis, sugar, garlic, ginger, lemongrass, lime juice, sweet chilli sauce, kaffir lime leaves and fish sauce in a jug. Cut fish into quarters. Cut calamari in half. Score inside flesh and cut into 3cm-wide pieces. Place seafood in a large bowl. Pour over marinade. Toss to coat. Refrigerate for 4 hours. Drain seafood from marinade. Heat a barbecue chargrill or chargrill pan over medium heat. Cook blue-eye, for 3 to 4 minutes each side or until browned and cooked through. Transfer to a plate. Cover. Cook salmon, prawns and calamari for 2 to 3 minutes each side or until salmon is just cooked through, prawns have turned pink in colour and calamari is cooked through. Serve with steamed jasmine rice and barbecued lime halves.